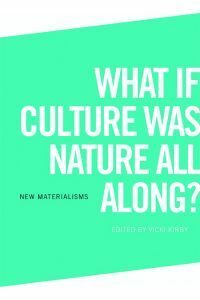 New Book: What if Culture Was Nature All Along? I’d like to let you know about a new book I’ve edited, What if Culture Was Nature All Along? (Edinburgh University Press, 2017). Please consider asking your university library to purchase this book (available now in hardcover and e-book). If you are interested in a personal copy, please note that a less expensive paperback version will come out in 2018. New materialisms argue for a more science friendly humanities, ventilating questions about methodology and subject matter and the importance of the non-human. However, these new sites of attention – climate, biology, affect, geology, animals and objects – tend to leverage their difference against language and the discursive. Similarly, questions about ontology have come to eclipse, and even eschew, those of epistemology. While this collection of essays is in kinship with this radical shake-up of how and what we study, the aim is to re-navigate what constitutes materiality. These efforts are encapsulated by a rewriting of the Derridean axiom, ‘there is no outside text’ as ‘there is no outside nature.’ What if nature has always been literate, numerate, social? And what happens to ‘the human’ if its exceptional identity and status is conceded quantum, non-local and ecological implication? Vicki Kirby has already produced an impressive corpus on the relations among life, matter and inscription. This new volume takes her unique and formidable mode of argument to a new level. For Kirby, both our conceptions of nature/culture and our notion of ‘turns’ – back to reality, materialism or life – require a more complex and intellectually more generous approach to relations and mediations. Drawing powerfully from recent work in feminist and critical theory this book will redefine the ways in which we think about life, the human and the posthuman. 10 Climate Change, Socially Synchronised: Are We Really Running out of Time?